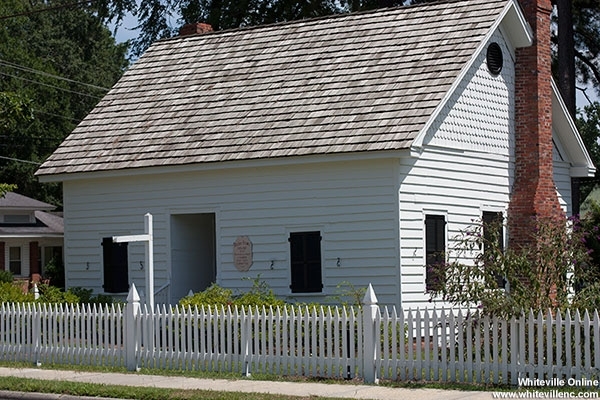 The Reuben Brown House is a late Federal-style country cottage built circa 1830 on farmland west of Whiteville. Reuben Brown, a former owner of the house, was schoolmaster for the Whiteville Academy subscription from 1869-1870. Reuben and his wife, Patience Teal Brown, and their children moved into this four-room cottage in 1869. The house was relocated to 128 East Columbus Street, Whiteville, NC and is owned by the Reuben Brown House Preservation Society, Inc. The house is open by appointment and serves as a center for cultural events in the town of Whiteville.